With the new Pope choosing Francis as his name, I took a look back at my photos of the Cathedral of Santa Croce in Florence. There is a certain artistic irony in the ostentation and richness of the Bardi Chapel, which is dedicated to the humble Saint Francis. He floats on the golden altarpiece, surrounded by jewel-like vignettes of his life. 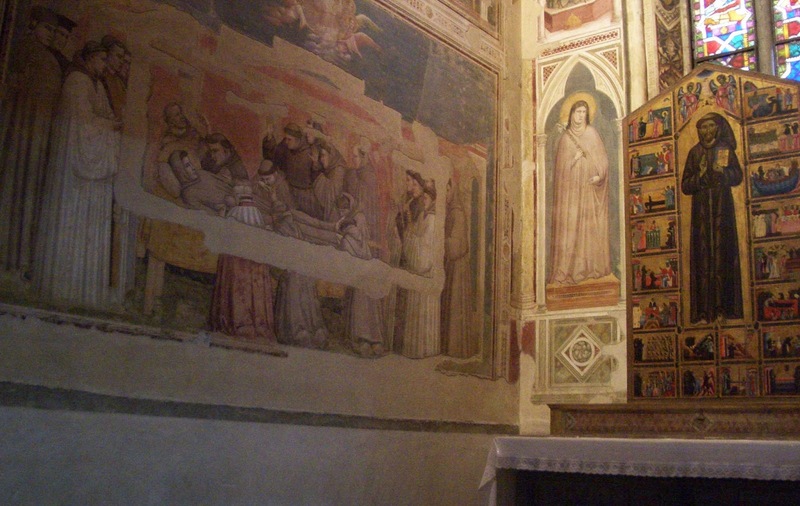 While this is supposed to represent the saint in heaven, the soft colors of Giottto’s fourteenth century frescoes more realistically portray the man. To me the frescoes seem more spiritually and emotionally moving than the magnificent altarpiece. Both the versions have their merits. But one speaks more clearly of a saint who celebrated simplicity and humility.